A massive improvement (actually a much larger difference/improvement even than it looks on the photos), and there is at least one room I like in the house now, yay! I managed to make a bit of progress on my Simply Solids Bee sewing, and pulled together the practise block for Patti for April, who has been a complete doll about me finishing hers, and told me to take my time. My quarter inch foot had a bit of a re-model a few months ago (when I forgot to return the needle to the centre position and crushed it, oops) and it's not been quite right since. So all of those teeny tiny HST's tested me a bit, which is ok, but it gave me the kick to sort out a replacement, which arrived yesterday, fingers crossed it's accurate! 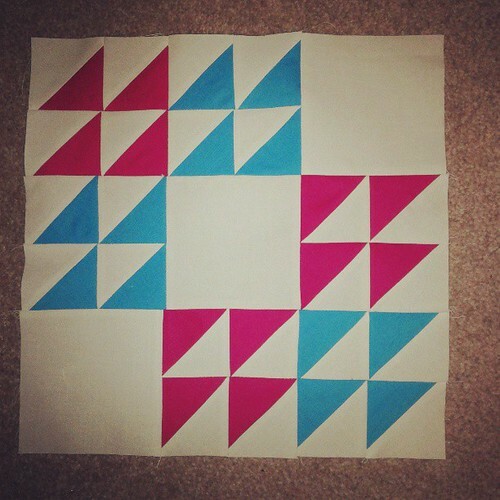 The real block is in progress and will be winging it's way to her really soon :o). Not a massive amount of progress for such a large amount of time, but then who cares, I had fun! That bedroom looks incredible! I have heard you and Susan had way too much fun - think you 2 need to come and play with me! 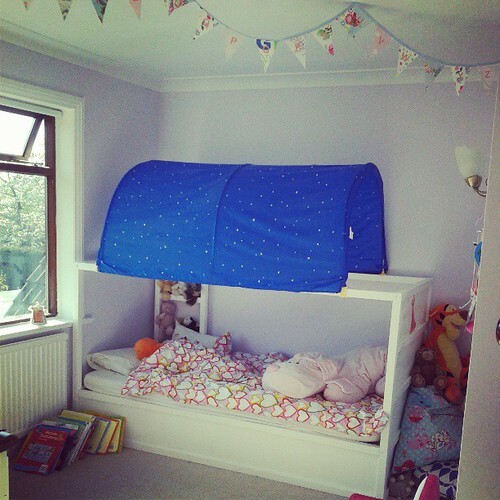 Fab job on the bedroom! 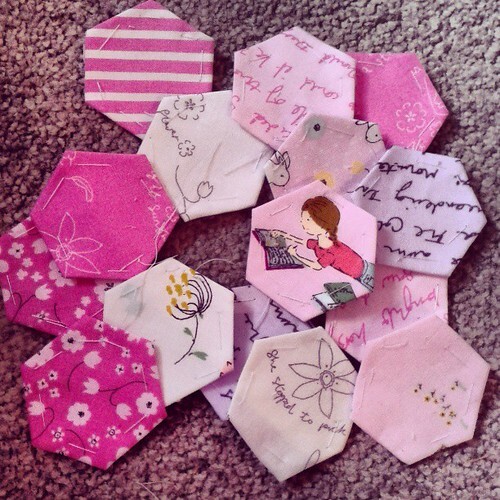 The hexies look very cute too. The new bedroom looks fabulous. I just love the starry bed canopy. Lots of fun and a few hexies sounds pretty normal when sewers get together. I had fun too. Thanks. And didn't time fly! Brilliant job on the room!! Love your simply solids bee block - point perfect! wow, that really is a change! it looks great! 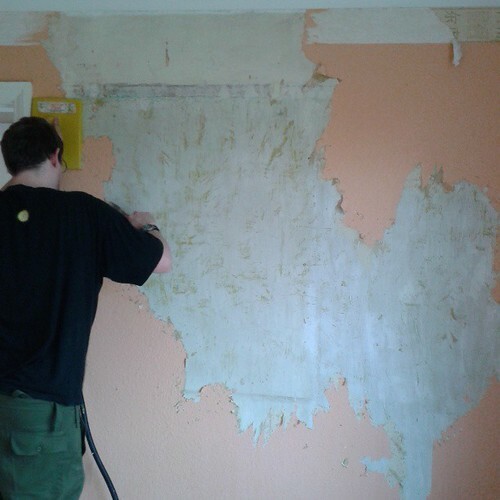 well done on the woodchip removal! That stuff is EVIL! Woodchip is such a pain to remove, I remember several houses we have lived in had the wretched stuff. But all worth it judging by the results! Those hexies look super, I love making them. 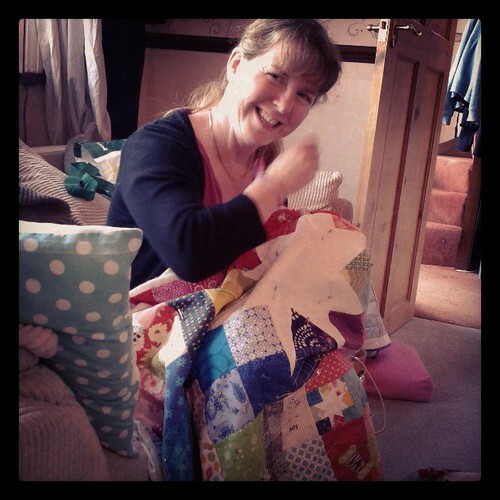 Ias that the quilt that Susan wouldn't let you see? Looks like you have it all under control! Yes - making progress in all sorts of areas. Lovely pic of Suz!